I now have two pairs of striped shorty socks with the same frame (rolled top, short leg, heel, toe) but very different stripe patterns. The tale of these two pairs was partly told in the last entry, but it goes like this. 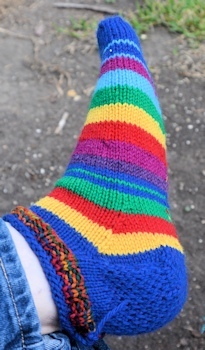 The original idea, because I had quite a bit of blue, red, and yellow leftover yarn, was to make socks in the colors I associated with the Ringling Brothers/Barnum & Bailey Circus videos our son loved when he was younger. However, though I started them close together, and got the heels turned the same day, Sock 1 got far ahead of Sock 2. I decided that some green would look better in the middle of the other colors (it's not the green you see--it's a rich, emerald green, but it always photographs lighter and "duller" than it is.) I was sick for a lot of the work on Sock 1. And then, by accident, I misplaced Sock 1 when Sock 2 had just started its first red stripe. I couldn't remember the relative proportion of the colors. After a month of unsuccessful hunting and grumping, I gave up and started a third sock to go with sock 2. 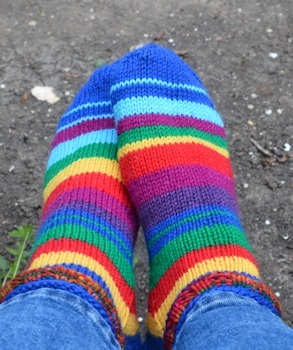 These became the "Rainbow" socks, and I finished them (except for weaving in the yarn tails for each stripe) right before heading to WorldCon. Single sock shows blue "frame"
The right sock is the original Sock 1, which extended to the yellow stripe below the toe. It was a little looser, and my right foot was more swollen, so I chose it for the right sock. The left sock was started after finding Sock 1, and completed on the WorldCon trip, mostly on the trains or while waiting in the St. Louis station for the Texas Eagle to arrive (long wait.) 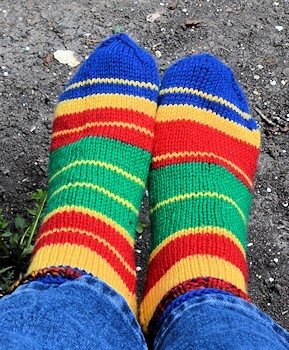 The "frame" of both socks is identical, except that the Rainbow socks have a one-row turquoise toe-stripe, and the Circus socks have a one-row yellow stripe. Yay! looking great. I'm more one for lace than stripes in my hand knit socks but to each her own, and long may she wave with the yarn and socks of her desire. These are terrific. Lace in socks is impractical here, but attractive on the feet & legs of others who are not coping with barbed wire, cactus, thorny vines, and critters that sting and bite. So I wish you as well with your lacework and thank you kindly for your respect for my stripes. I shall pass this post on to an enthusiastic knitting friend. I hope the knitting friend enjoys it. Those are beautiful, and worthy of our retired Irish nurse friend who knits for our Stitches of Love group up here ... Theresa would love them. They're gorgeous! I always look at your socks and think that I need to try crocheting socks of my own. I did get as far as finding a pattern to try but I haven't managed to get around to finding appropriate yarn and trying it.